Pre-cleaning and post-cleaning. What you need to know about our services in your home. 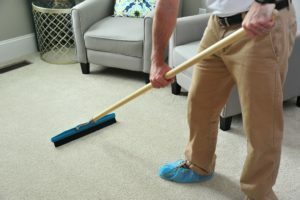 If you’ve never had your carpets cleaned, you can be a little worried about what you are expected to do and what tasks the technician will handle. We have outlined how we handle your scheduled cleaning appointment and what you can do to help before we arrive. For their own safety, please arrange to keep children and pets out of the area being cleaned. Secure any full-length draperies to a height at least 12 inches off the floor. Please direct the technician to any spot or stains that may require special attention. Inform the technician of any high value or antique furnishings in the areas being cleaned. For your protection and convenience, the technician will not attempt to disconnect or rearrange electrical connections. In the event that you must reschedule your appointment, please do so at least 24 hours in advance. Inspect the areas cleaned with your technician. Check to make sure all furniture is in its proper location. Ask for an estimate of drying time or any special drying instructions. You may pay your technician with cash, check Visa or Mastercard. Try to stay off the carpet until it completely dries. If you must walk on it, use extreme caution when stepping back onto hard surfaces such as tile, as this may create a slip hazard. Leave HVAC blower in the on position and turn on the ceiling fans until the carpet is completely dry. Leave moisture shield under the furniture for at least 24 hours. Vacuum soon after, and regularly after the carpet has dried. If you have any questions, please be sure to contact our office. We ask that you report concerns regarding cleaning results within 10 days of service. Your carpet will be dry in 6-8 hours depending on humidity conditions. Low air flow can affect drying time as well.